The medial and lateral meniscii have important functions mainly as load distributors in the knee. Unfortunately torn meniscii occur very frequently and most tears are either irreparable or are extremely unlikely to heal if they are repaired. In these circumstances if patients have persistent symptoms then removal of the torn, unstable fragment is likely to relieve their symptoms. Patient who sustain an irreparable tear are more likely to develop degenerative wear and tear osteoarthritis (often the tear is part of this process). Whether or not the torn fragments are removed or not does not influence the rate at which any wear and tear changes develop as a consequence as the torn portion of meniscus is not functional. However certain types of tears in some patients have potential to heal if repaired. 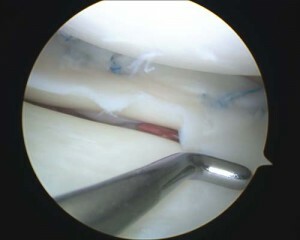 The aim of repairing the meniscus is to try and protect the joint surfaces from possible later wear and tear arthritis. 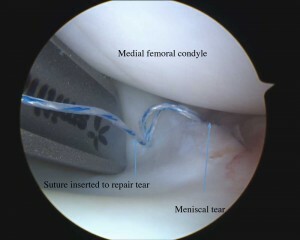 The operation involves passing sutures or special fixation devices ito repair the torn meniscus. Most repairs can be performed arthroscopically but for large tears and tears in particular places it may be necessary to make a small incision on the side of the knee in order to tie the sutures. The post-operative rehabilitation is slower than after a standard knee arthroscopy as the meniscal repair needs to be protected from excessive forces whilst it is healing. My patients are guided, with the help of a physiotherapist, through a rehabilitation program that I tailor to the individual patient depending on the size and nature of their tear. Most patients will need to use crutches for a period of two to six weeks, use a knee brace for the first few weeks and restrict the range of movement for up to six weeks following surgery. Patients should not squat for three months and generally it is three months before they can return to sports. 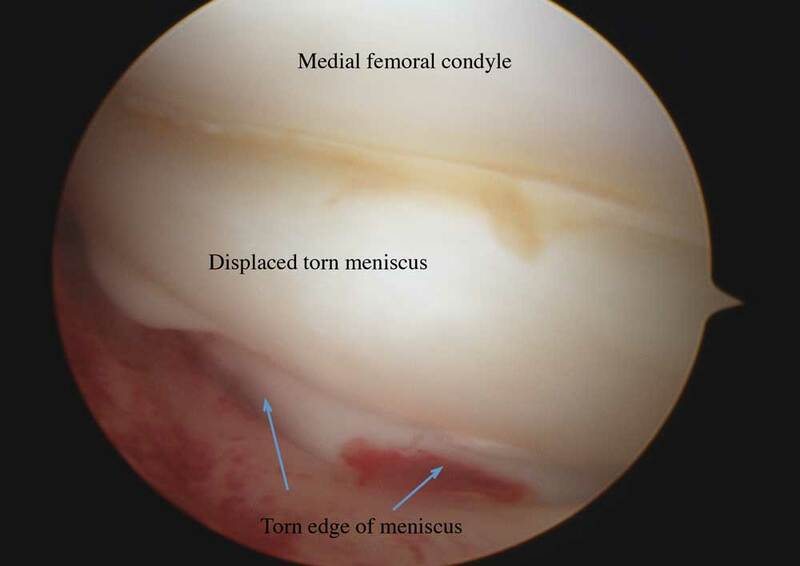 Repair of a torn meniscus will lead to it healing in approximately 70% of cases. Unfortunately approximately 30% of repairs will not heal and for these patients if they have persistent symptoms then a further arthroscopy is required to remove the torn portion of the mensicus. Patients who lose mensicus volume at a young age will inevitably develop wear and tear osteoarthritis and if they have persistent symptoms meniscal replacement techniques offer a way of reducing and delaying this risk. A small percentage of patients who lose all or part of their meniscus will be suitable for a meniscal replacement technique. Patients who lose only part of their meniscus might be suitable for implantation of an artificial device, the menaflex or collagen meniscal implant. Patients who lose all of a meniscus are not suitable for this device might be suitable for a mensical transplant. Both these procedures are safe and well established with evidence they improve symptoms in suitable patients. However these operations involve a more significant rehabilitation period and whilst their is good evidence that they improve symptoms they might not abolish them completely and patients are unlikely to enable patients to return to high impact sports. This procedure involves implantation of a mensical scaffold (actifit) to replace the portion of meniscus that he ben lost. The menaflex was developed in the USA and now more than 2000 have been implanted worldwide. It is made from highly purified collagen and provides a scaffold that allows the bodies own tissues to replace it with tissue to replace the meniscal function. Long term randomised clinical trials have shown that for suitable patients they are safe and patients who had a menaflex implanted had less pain and higher levels of function than patients who did not have torn portion of mensicus replaced. Rehabilitation after surgery is more prolonged as their is a need to protect the menaflex implant as tissue grows into and replaces the implant. as the body has to grow tissue into the scaffold and this is a slow process. Patients tend to need to use crutches for a minimum of six weeks and need to use a brace in the first six weeks following surgery I tailor a specific rehabilitation program to each patient depending on their individual circumstances. Meniscal Transplantation is an operation that involves implanting a donor graft (allograft) supplied from a tissue bank . The new meniscus is implanted mainly with arthroscopic surgery (although often several more incisions are required) and sutured to the site of the original meniscus. The implanted mensicus has to be of the correct size and often there can be difficulty and therefore some delay in finding a donor meniscus of the correct size. The grafts are donated like other organ transplants and are then prepared and frozen until required for a suitable patient. The grafts are carefully selected and prepared under a closely regulated system by the tissue banks to ensure that the tissue is as free of disease risk as is possible. With this the risk of any disease transmission is extremely low but difficult to quantify. The rehabilitation period is relatively long with patients having to use crutches and a brace for a minimum of six weeks and it is often a year until a patient gains maximal function. As expected, whilst it is a very safe operation the level of risk is higher than that of a straightforward meniscal repair or menaflex implantation. Therefore Meniscal transplant is indicated when patients have a significant level of pain from loss of the entire meniscus but has to be performed before advanced degenerative changes develop. Due to the nature of the procedure, the rehabilitation and the risks involved it should not be performed simply because he meniscus has to be removed as the majority of patients who lose a meniscus will have meany year of symptoms free activity. It is difficult to get evidence to show that it might slow the development of degenerative changes it is an operation that is aimed at reducing symptoms with hopefully the added benefit that it might slow the rate of development of degenerative changes. Whilst their is good evidence that transplantation reduces symptoms it is unlikely to result in a normal knee capable of returning to high levels of impact sports.